DE Lux provides top quality accommodation in luxurious, high-quality and modern apartment on the impeccable location in Sarajevo. 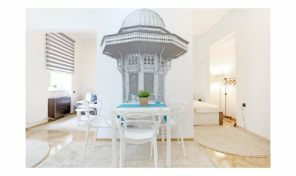 Luxurious apartment in the very center of Sarajevo, offers an ideal opportunity for exploring the city and its traditions, culture and atmosphere first hand. The apartment is ideal for business trips, family accommodation, or accommodation and small groups. Apartment De Lux spreads over 35 m2 on the second floor and consists of living room and kitchen and provides space to accommodate from 2 to 5 persons. Guests can enjoy traditional sarejevskom spirit in the town center which is the beauty of the city’s main pedestrian zone within a few minutes walk away, and the pedestrian zone are the most important monuments and cultural buildings of the capital. Apartment De Lux in the inner city core Is characterized by large rooms with modern interior design and technical equipment have turned into a pleasant blend of urban and traditional. 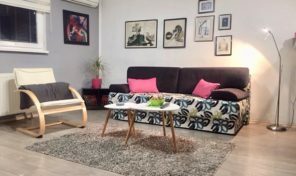 Besides the spaciousness, location and modern comfort, the apartment provides a special value all technical equipment including LCD television, cable television, free wireless internet. Price per day for two people. Children under 3 years free of charge,. Extra bed costs € 8. The apartment has a high standard, high-quality bearings and fully equipped kitchen. NOTE: rent apartments for a longer period (more than 7 days) we give special discounts. 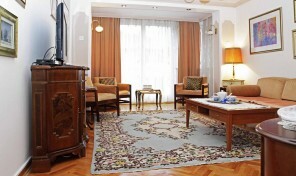 Apartmens Sarajevo located in the very center of Sarajevo, fully equipped for a pleasant and comfortable stay, excellent business and city break destination throughout the year. Prime location in the center of Sarajevo, where a few minutes' walk from the most important historical, cultural and entertainment facilities, provides guests experience the city noise, the traditional spirit, a sense of rhythm and atmosphere of the city and exploring ways of life. Smoking is not allowed in the apartment. Children under 3 years free, children from 3 years old or adults are charged € 8 per night for an extra bed.